MsExhange: mengaktifkan message tracking di Exchange..
Mail Access Monitor for MS Exchange Server searches for log files of the *.log type. Message tracking must be enabled for a component to begin recording activity in the tracking log. When you enable message tracking for any component, all similar components on servers in that site write to the tracking log. Tracking logs are located in Exchsrvr\Tracking.log. Each daily log is named by the date on which it was created in yyyymmdd.log format. The file name date, like all time in the tracking log, is in Greenwich mean time. In the Exchange Server Administrator program, double-click Information Store Site Configuration. Click the General tab, and click to select the Enable message tracking check box. In the Exchange Server Administrator program, double-click MTA Site Configuration. Click the General tab, and click to select the Enable message tracking check box. Double-click on the Internet mail connector for this site.. Click the Internet Mail tab, and click to select the Enable message tracking check box. The message tracking feature available in Microsoft Exchange Server 5.5 has been implemented in Microsoft Exchange 2000 Server with some differences. In Exchange Server 5.5, the message tracking was a per-component feature and had to be enabled at two separate locations (in the information store and in the message transfer agent [MTA]) for complete tracking to occur. In Exchange 2000, there is a single location for enabling message tracking. Tracking logs are located in the\Exchsrvr\YourServerName.log folder. Each daily log is named according to the date that it was created (in the yyyymmdd.log format). Like all times in the tracking log, the file name date is in coordinated universal time (UTC, or Greenwich Mean Time [GMT]). Locate the Servers container.NOTE: The Servers container can be at the top level if no Administrative Groups are defined or displayed. If Administrative Groups are defined or displayed, the container can be found in the relevant Administrative Group container. Expand the Servers container to see the list of servers. Click the server on which you intend to enable tracking. On the General tab, click to select the Enable Message Tracking check box. Ensure that the log file maintenance information suits the needs for logging. Tracking logs are located in the C:\Program Files\Microsoft\Exchange Server\V14\TransportRoles\Logs\MessageTracking\ folder. Each daily log is named according to the date that it was created (in the MSGTRKyyyymmdd.log format). Like all times in the tracking log, the file name date is in coordinated universal time (UTC, or Greenwich Mean Time [GMT]). Locate the Server Configuration container. On the Log Settings tab, click to select the Enable message tracking log check box. Local and Remote Solutions from AKCP allow you to create a completely integrated Personnel Tracking solution. The Door Control Unit provides advanced remote site technology with integrated cameras and access control from 1 to 5000 remote sites. AKCP is introducing a world first. Distributed Access Control, an intelligent system that tells you who has entered your computer data room, when they exited all visualized on an intuitive central management system. Our Fingerprint Access Readers come equipped with advanced capture technology. This not only provides a high level of security but also real time access statistics for your entire remote site infrastructure. Did You Know ? AKCess Pro's advanced fingerprint scanners use a digitized reading of your finger as a security access key. Fingerprinting is often used in buldings that require a high level of security, such as network data centers and military / government sites. AKCess Pro Server's Time & Attendance Visual Reporting feature allows you to view and output wide variety of reports unique to your own system. The AKCess Pro Server Management Software includes a number of popular report types so you can start to use your data effectively. Access Times of each Remote / Local Site. There may be occasions when you need to restrict access or even block personnel from sensitive areas or remote site locations. This is especially true when many engineers require access to servers or other business critical equipment. With AKCP Server, it's possible to automate this Action should access be attempted by a blocked user, or simply a user who does not have the sufficient Access Permissions. Access Rights can be enabled or disabled to restrict access to a single user after a specific date. This is particularly useful in maintenance situations or for guest user scenarios. All of this can be monitored and administered remotely using AKCP Server Server and Client Software. For Example : "I want to send an Email when unauthorized personnel try to access my secure data room." With AKCP Server, this process is easy and intuitive. The access attempt by the unauthorized personnel will generate an email as set up in your parameters with details of the location, time, date plus detailed photographs of the event. Local and Remote Solutions from AKCP allow you to start with a basic package to enable monitoring and control over a single site. Having everything modular ensures that you get exactly what you need. It's easy to integrate with existing solutions or add additional High Definition digital cameras, environmental sensors, siren strobe alarms, smoke detectors, power monitors, and relay switches to existing local or remote sites. As of AKCP's equipment feature full integration with the AKCP Server Management Software. Automate corrective action, apply software updates and distribute notifications to all of your remote sites such as powering off lights and equipment in unoccupied sites, enable or disable an engineers access and even unlock sites remotely. Local and Remote Solutions from AKCess Pro allow you to create a complete and integrated CCTV Solution. Now you can see who has entered your computer data room, when they exited and visualize all of this with integrated video playback and recording. What's more, with AKCess Pro Server you can drag & drop your doors, sensors, cameras and access control readers - all of your monitoring devices, onto any map of your choice. Monitor an overview, or drill down to a specific device location. Maps showing cities, countries, buildings, and specific rooms are easily combined as a visual representation with a host of preset animations to use. a single map or 'drill down' to show local site information. Combined with the AKCess Pro Server, Event Log and Notification integration suite this becomes a powerful tool in averting potential disaster or loss of mission critical resources. 14 2012/05/07 09:10:16 E-mail sent to Security Services "Alert : Temperature Low Critical"
The backbone to each of your telecoms locations is the securityProbe, a sophisticated unit with interfaces that allow you to set parameters for monitoring temperature, humidity, water leakage, motion detection, door security and importantly generator fuel levels. As well as environmental monitoring the securityProbe also lets you add up to 4 outdoor weatherproof IR cameras for CCTV surveillance purposes so you can see what is happening even if you cannot physically be there. The securityProbe integrates with a wide variety of intelligent sensors giving you great flexibility in building a complete monitoring and control environment to match your exact Telecom Site requirements. Distributed storage and review of the pictures, graphing and sensor events on the securityProbe is easy. Everything is saved locally with up to 32 GigaBytes of local flash storage available. A great feature of all AKCP products is their ability to connect to the AKCess Pro Server. This effectively creates mass storage capabilities limited only to specifications of the Server Storage. The securityProbe is a highly intelligent local control device with interfaces that allow you to set parameters for monitoring and control of temperature, humidity, generator fuel levels and run time, voltage status, battery health etc. No other software or hardware is required. All of the AKCP sensors can be tied to notification actions that are setup on the securityProbe’s built in IP based web interface. Notifications are sent automatically when their pre-set thresholds are reached. No other hardware or software is required. SMS, MMS and Voice call alerts can be sent automatically from the unit using a GSM modem. It is quite common for these remote Telecom sites to not have access to any network (LAN or WAN) due to their remote locations. The only access possible is then via a GPRS network through GSM USB modems. The EDGE 180M GSM USB modem is a third party modem that can be connected to the securityProbe on board USB port allowing for the real time status of the unit and sensors to be pushed out at pre-set intervals. This modem has been fully tested and is offered as an accessory by AKCess Pro. The GSM modem allows the data from the unit and of all the sensors to periodically (any preset time required) be sent directly to web servers. This is performed using an HTTP GET/POST through the "heartbeat" message feature as a script. The internal temperature and humidity of the equipment cabinet or storage container at the remote sites can be monitored using AKCP's single port dual temperature \ humidly sensor. Alerts can be sent if preset thresholds are reached. AKCP is the only company in the world that provides an integrated approach to Sensor, Video and Personnel Monitoring. AKCess Pro has been successfully designing and manufacturing cutting edge monitoring equipment for over 30 years and we are the market leaders in environmental and security monitoring for many industries. AKCess Pro environmental monitoring units and sensors are easy to install with simple wizards to help you along the way. Once installed, you have the option of using the AKCess Pro Server application, a central monitoring software that is both intuitive to use and configure so you will be up and running in no time. One of the key features of AKCP's Local and Remote Solutions is buffered file transfers. When interruptions to network communication occur, all Sensor, CCTV and Personnel information is saved locally on the base unit. All of this information is then automatically sent to AKCP's Central Management Software when full network connectivity has been restored. This makes AKCP products an ideal for both Local and Remote Applications. Multiple securityProbe's in different locations can be controlled from the probeManager interface in the AKCess Pro Server application, all aimed at giving you added peace of mind that your remote telecoms locations are secure and operational. Simply by adding a range of securityProbe or sensorProbe IP's you can 'Get' or 'Send' Configuration, Notification and Firmware Updates to all of the probes in your distributed network. updates to all of your remote sites over a LAN or WAN connection. Once installed the AKCess Pro Server has an additional client that can be installed on an Apple iPhone device. This connects to your server giving you remote access to your workspace. This makes it easy to monitor video cameras and devices wherever you are in the world and is perfect for remote Access Control applications. View who and when someone is trying to enter a secure room and check on the environmental aspects like temperature or humidity. You get the same comprehensive access to AKCess Pro devices and cameras but in an easy to use Apple iPhone interface. ADManager Plus, tools ManageEngine untuk Active Directory juga bisa digunakan oleh tim HR / SDM, sehingga memudahkan tugas IT dalam mendukung manajemen user. 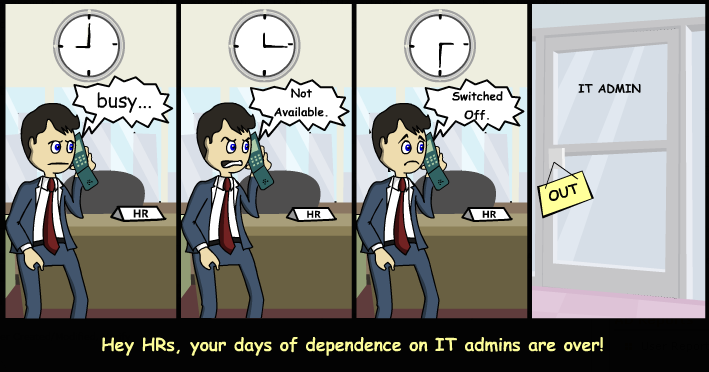 Yes, HRs can be IT admins too!! Create User Accounts for New Employees. Assign/modify the required permissions, group memberships to users. Update existing Employees' Contact details. Enable/ Disable an employee's account. Update Departmental information like Manager, Department, etc. for existing employees. For all the HRs who have to depend on their AD or IT team for every one of these tasks every single time and for the AD administrators who rack their brains to figure out a way to make the HRs accomplish all the HR related AD tasks, ADManager Plus's 'Task based' and 'OU based' delegation offers the easy way out! It's a win-win for both the HRs and the AD Technicians. With ADManager Plus's task based delegation, AD Administrators can delegate all the HR related tasks like User Account Creation, User Account Modification, etc. to the HR team, in a safe and secure manner and turn even the technically naive HRs to AD admins, without even the HRs knowing any technical details about those tasks. This is totally unimaginable when using traditional options like native AD tools, PowerShell, etc. And the HRs can rest easy too as they do not have to depend on the IT team to accomplish all the HR related AD tasks, and with the bulk user creation , bulk user modification/updation features, can now complete all their processes, themselves, much easier and faster.